The reports section of your administrative website gives you access to your time data by employee, job or task in just a few clicks. You can view and download the reports, or export them as CSV files you can open in a spreadsheet program or import into other software. To access your reports, simply go the to "Reports" item in the top menu, and select the report you want to run from the drop-down list. On the reports page, you can switch between the reports using the tabs at the top. CSV Export: a report that downloads a CSV file with rows for each time segment that includes the employee, job, task, job number, task code, start time, end time, break minutes, billable minutes, total minutes (break + billable) and Hour Minute or Decimal Hours time (depending on your account settings). Each report has filters you can use to select what data will be included in that report. 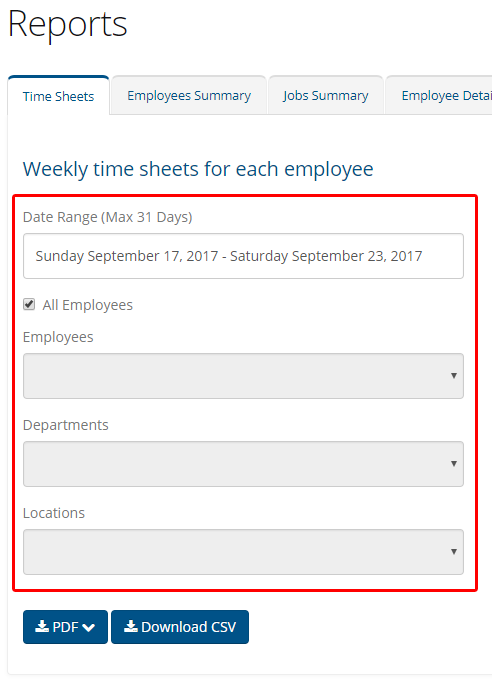 Every report allows you to specify a date range and what employees you want to be included. Some reports have unique filters, like being able to select which jobs to include on the Jobs Summary and Job Detail reports or what tasks to include on the Task Summary and Task Detail reports. There is also a checkbox to indicate whether you want the notes attached to time segments included in the Employee Details, Job Details, Task Detail or CSV Export reports. NOTE: If you want to use the Employees, Departments or Locations filters, make sure you uncheck the "All Employees" checkbox. Once you have the report and filters you want selected, you can either view or download the report as a PDF or download a CSV version of the report. You can view or download a PDF version of the report by selecting the option you want from the PDF drop-down menu. Each PDF report is available in portrait or landscape orientation. Alternatively, you can download a CSV file of each report by using the Download CSV button. CSV files can be opened in spreadsheet programs like Excel or Google Sheets and is a great choice if we want to reformat or further analyze your time data.